(special pricing for uniform customers)tanned cowhide leather cover; raised seams that are double stitched with special waxed cotton thread; wool/polyester winding; polyester winding; wound rubber cork center; official size and weight. (special pricing for uniform customers) full-grain cowhide leather cover; raised seams that are double stitched with special waxed cotton thread; wool/polyester winding; cushioned cork center; official size and weight. (special pricing for uniform customers) top grade cowhide leather cover; raised seams that are double stitched with special waxed cotton thread; gray wool winding; cushioned cork center; official size and weight. (special pricing for uniform customers) synthetic leather cover practice ball; solid cork and rubber center; raised double stitched seams with special waxed cotton thread; recommended for t-ball and little league practice; official size and weight. 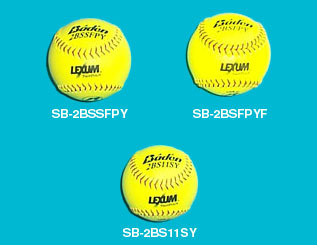 SB-2BSSFPY Game Synthetic Leather Softball, 12"
(special pricing for uniform customers) made of high quality synthetic leather; optic yellow for day/night play; excellent feel and grip; red stitch; .47 Cor recommended for fast pitch; 12"
SB-2BSFPYF Leather Game Softball, 12"
(special pricing for uniform customers) made of high quality leather; NFHS approved and stamped; optic yellow for day/night play; excellent feel and grip; red stitch; .47 Cor recommended for fast pitch; 12"
SB-2BS11SY Game Synthetic Leather Softball, 11"